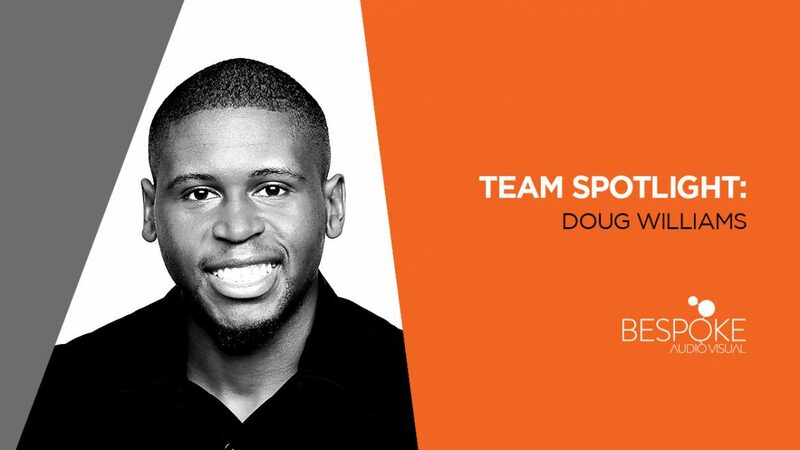 In this edition of our team spotlight series, we are introducing you to Technical Coordinator, Doug Williams. Doug has worked in the audio visual industry for more than seven years. His professionalism, depth of knowledge and positive attitude are true assets to the Bespoke Audio Visual team. The bold challenges and new experiences that I can have in working for a team of talented, motivated individuals. At least that’s what the boss told me to say! I actually am excited to work with a company that genuinely tries to do AV the right way, treating its clientele and it employees with the same attention to detail, courtesy and respect. Not doing AV! I dance swing periodically and am currently trying to learn Spanish. I also know how to play the keys. Music and travel. I would love to see more of the world and spend time living in another country experiencing different cultures. Motivational speaking. I like convincing people to think outside the box and become more than the ordinary. Being able to empower and inspire someone with just words is an amazing gift, and I feel like I do that pretty well. It’s the part of Bespoke Audio Visual that I think is unique. We can take your event idea and spark it to life using descriptions, drawings plans and of course, some pretty sweet gear! One you wouldn’t want to return from! Apart from life in general? I joke, mostly video or webcast questions but occasionally I get to play Montell Jordan and deal with some real serious issues. That’s a hard one, there is so much to learn. I guess the world we live in. Space is cool and all, but it’s got nothing on Planet Earth. Who has really impressed you most with what they have accomplished? Easy. My parents. They left Jamaica and made life here with my brother, two sisters and I. Coming with nothing to Canada and starting from scratch, breaking cultural, racial and language barriers so that we could thrive. They raised us, taught us about family, faith in God and how to live with and respect other people. They are my example of what great human beings are. Plus, I got Caribbean food everyday. You can’t go wrong with that! Ideally, running an event hall with live bands from the Motown era. But most weekends I have to settle for just cleaning the house and bumping tunes. I intend to bring back the Fresh Prince flat-top haircut and 90s style athletic wear. Also, jeans with deep pockets! It is impossible to own a sizeable smartphone as a dude with no pockets. I found $10 bucks on the subway – twice. See Disney’s Lion King in 2019, VIP seats, with hand on chest and sing the opening song in the theatre and I don’t mean when it gets to the Circle of Life. Uh-huh that’s right, that part. I was working at a festival and the security officer thought I looked like Usher. True story. I would write a sequel to Willy Wonka and the Chocolate Factory, adult version, ideally. But realistically, I would probably write about how to be the best human possible. We need more awesome humans. I’m very pleased to have come across this Bespoke team profile. I think it deserves a comment. I’ve worked with Doug on numerous occasions and in a number of capacities and I am very happy to see him flourishing at Bespoke. He works incredibly hard, has some broadly based experience that he is able to leverage, and is a pleasure to deal with even in the most adverse of conditions. I’ve been there and I’ve seen it first hand. If you see Doug on your project, you can be confident that he things will get done. I’m glad Bespoke saw fit to profile Doug. He deserves the recognition, and you deserve to know more about him.